A new feature to help you get articles through the submission process faster. Our team of human editors can now highlight problem areas for you. This new highlight feature should quickly answer questions you have about why an article has been placed in problem status. Just like before, when an article you’ve submitted is placed in problem status, you’ll receive an email notification of the details with a link to fix the article. 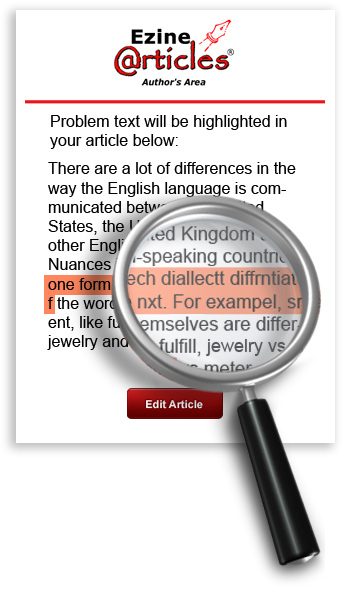 Unlike before, the email will also include a copy of the entire article with problem areas highlighted. This new capability should help you narrow down exactly what part of the article caused it to be placed in problem status. It’ll also reduce the number of times you’ll need to interact with our Member Support Team because the answers to most of your questions will be in the highlighted portions of text. In turn, this will reduce the time required to get your articles through the approval process. Articles are placed in problem status if they don’t abide by our Editorial Guidelines. Read the guidelines and keep them in mind while writing and submitting articles. To further avoid roadblocks in the approval process, check out our 2 Minute Approval Tips video series. You can jump directly from the problem status email to the article edit page. When you’re in the email, you’re just one click away from the submission page and fixing what needs to be fixed. If there are multiple problems, they will be highlighted and color coded so you know what problems go with each highlighted section. Currently, the highlight feature is only available for certain problems. In the future, this may be expanded to more. There are some problems that can’t be explained in a highlighted section or quick email. If the email requests that you contact Member Support or you are unsure what the problem is, contact us through your Author’s Area. Note: Only one section of text can be highlighted per problem so our editorial staff can point to the main issues. This also means that changing the highlighted portion won’t guarantee your article’s approval upon resubmission. The highlighted areas are meant to give you an idea of the problems. You’ll still need to revise the entire article for recurring and similar issues. This new feature should make the approval process smoother and easier to understand. Leave a comment to let us know what you think. This sounds like it will be very helpful. Man, this is a great Idea! Glad you guys got around to it. I am looking forward to the next 100 day challenge using this. It’s gonna’ make submissions and corrections much less frustrating. Thank you! This will be of tremendous help. Last challenge I submitted a boat load of articles on a particular topic. There must have been a couple of reviewers. I wasn’t sure of what would be accepted. When the first ones were accepted, I wrote the rest the same way. They were rejected. I had no idea why. I kept tinkering with the one’s being rejected and they continued to be rejected. I was pulling my hair out. When I finally got a response … it was during challenge time and they had a lot to do … the one’s that were accepted before, according to this reviewer shouldn’t have been. So, I had been going to erroneous information. Knowing the problem immediately would have been a huge help. Thanks – this is a great idea. Much easier for all of us – we’ll have a better idea of what we did wrong and you’ll have less to wade through from the rewrites. It’s helpful to every author. I like this. Sounds like a great feature to me. Even after several articles we all miss things now and again, and this will make corrections much more efficient. Thanks! THIS IS GREAT! Plus, even if you cannont highlight mulitple paragraphs, the author can review the rest for similar problems and fix it. This is a great innovation and positive evolution for the article marketing specialist user. Thank you very much, I think this is wonderful. I felt so dense when I received four “problem” emails and could not solve what was wrong. This will be very helpful. Thank you. ANOTHER GEM added to your crown. This was exactly what was expected from you since it will save a lot of time. Yes. This is helpful to us and save a lot of our time. Thanks. Good idea bro.Highlighting the areas of mistakes in articles allows both author and reviewers to be benefited.but its better to remove some silly mistakes by yourself rather than emailing them through highlighted portion.because mistakes are human tendency. This sounds great should help out heaps when it comes to editing for review again. Anything that makes life that little bit easier gets the thumbs up from me! What a great idea! I would suggest adding a little footnote at the end of the highlighted sentence. The footnote would refer to theparticular section in the editorial guidelines where the problem is referenced. I think this is a great idea. I spent a lot of time re-writing the wrong bit of an article because the standard comment couldn’t make it clear which bit was wrong. Ithink this will be very helpful. Great. I was expeting this from a long time ago. Thanks. Yes at last, my spelling sometimes can go bad especially when I’m tired, this sorts that out and with the new auto save function, well, no more big mistakes are going to happen really. Thanks ! This will be great and will really speed things up. I submitted an article a week ago and was notified yesterday that it had been rejected. In the email I was told I had to contact support to find out the reason. You guys read my mind! Fantastic customer service evolution! Love the new blog design too. This is great. This is a great feature. It will make things much easier for authors. Thanks. I just got an article rejected. Said the body doesn’t deliver on the title. That’s absurd. It also says there are spelling errors, I can’t spell so i believe it. But, no highlighted. Oh well, I know where to put the article. A team member of the Member support team will be emailing you privately on this issue. I have been noticing that the turn around time for article approval are faster (when there’s no errors). I noticed that acceptance rate is faster. Especially when there are no errors. Is this a coincidence? The less errors you have in your articles, the faster we are in our article reviews. How many articles can i submit per day? The first 2 membership levels require an account review/upgrade once the submissions have been used. We will review your account for an upgrade within 12 business hours once you have depleted all of your submissions. So to answer your question, you can submit as many as you want per day providing you have the submissions allotted to you.